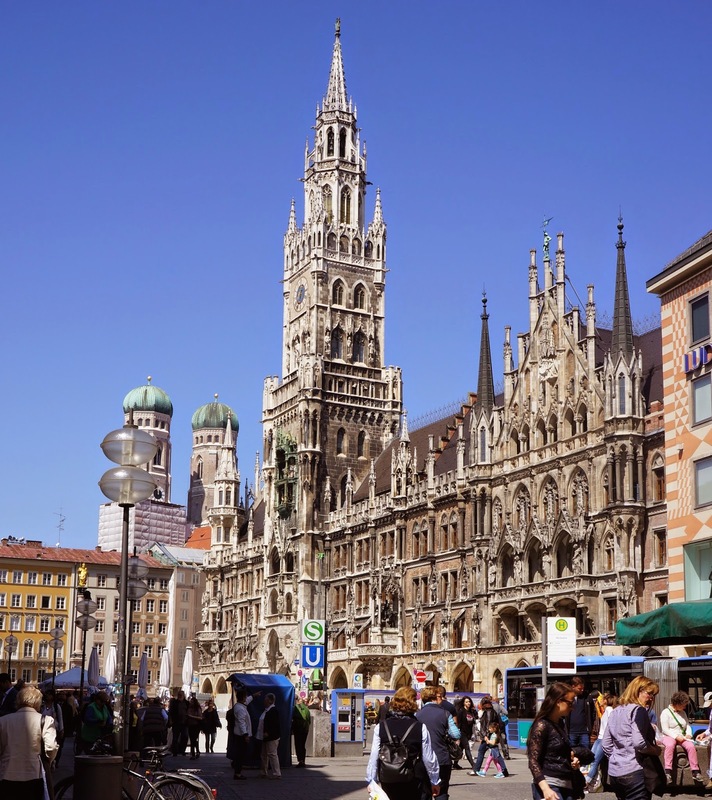 RETIRE IN STYLE BLOG: Why Do I Feel So At Home in Munich? Why Do I Feel So At Home in Munich? I love Germany and want to return even though I have barely arrived. Why is that? I think it was in a book written by Stephen Ambrose that I read about American soldiers feeling so at home in Germany after WWII. I had never been to the country until yesterday. Now I can tell you why I think Ambrose was right...I think Germany is a true reflection of what we aspire to be. Here in Munich I see such a beautiful place...it seems to me at first glance that the Germans have vetted life and gotten rid of all the unnecessary neon leaving only what is wanted. Even the hair dresser that is a short distance away does not have a sign out front...in fact there is not a sign to be seen as you walk down the streets. The hair dressers just go about their business in a beautiful room with a window to the world. I don't know but I guess that if I walked in they would tell me how to get my hair cut. Tomorrow I will ask. Last night we walked out into the neighborhood for supper. The beautiful warm weather brought parents out in droves to walk babies in strollers and let them play in the parks. It was good to see bicycles every where and the parks along the river full of runners. We walked from the Derag LivingHotel where we are staying to the Marienplatz. We turned right as we left the hotel, turned left at the Isar River and went east two bridges, turned left and took the first street to the right. As we wended our way through the 5 story high buildings, the fresh market came into sight. The walk took us about 20 minutes. We drank coffee and wandered through all the fresh produce. We went a bit more east and my husband came rushing back to find me. He led me by the hand around the corner and there it was...the most beautiful building I have ever seen. Part cathedral, part city hall, all German. In the Middle Ages markets and tournaments were held in this city square. 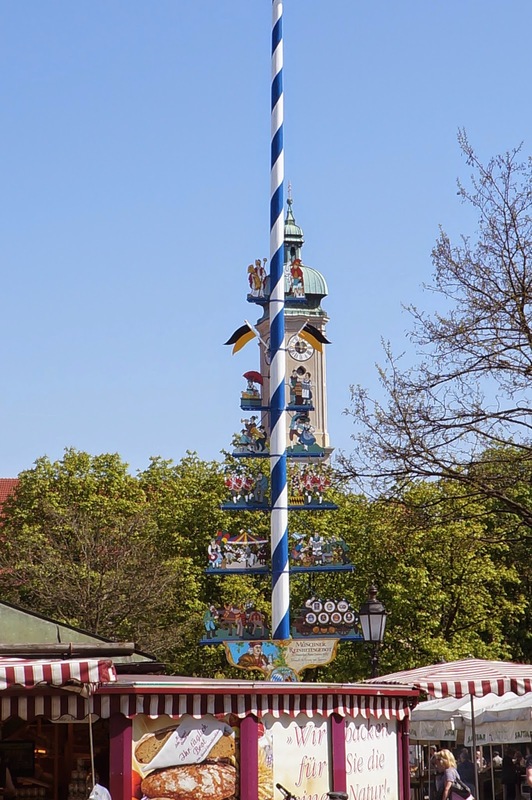 Marienplatz was named after the Mariensäule, aMarian column erected in its centre in 1638 to celebrate the end of Swedish occupation. Today the Marienplatz is dominated by the New City Hall (Neues Rathaus) on the north side. 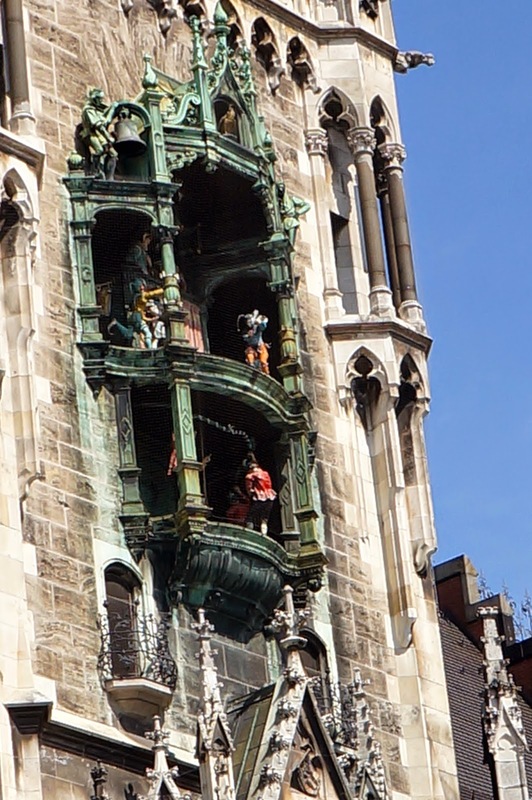 The Glockenspiel in the tower of the new city hall was inspired by these tournaments, and draws millions of tourists a year. At the east side Munich's Old City Hall (Altes Rathaus) is located. It's a gothic council hall and ballroom and tower, which have been reconstructed. not know that a city hall could look like this! WOW! As spring arrives in Germany, the people emerge from every nook and cranny. Restaurants are set up in the street and beer gardens are everywhere. We drank coffee in the fresh market, ate in the the interior courtyard of the city hall and wandered through the shopping area to have a beer in an Irish pub. and to a big beer garden during October fest I think. Mount Angel, Oregon has a pole just like the one you see there. Inner courtyard of the town hall...we had lunch here. I know that you can buy a Lonely Planet guide for all of this. It will be a great help. But no one can help you like a local waiter. Today the waiter at the Irish pub could not tell us the street we needed but simply pointed. We did not go wrong. When I told him that if I got lost I knew where he worked and would be back, he just laughed. We use Google Maps to get around but generally just follow our nose. My husband asked me today what the plan was. I could only answer that if I was in front the plan was for him to follow me. If he were in front I would do the same. The best part of the whole day was rounding that corner and seeing the Neues Rathaus situated on the Marienplatz with outdoor restaurants filling the square. It was the thrill of a lifetime. And yes, Stephen Ambrose was right...I do feel very much at home. I love that feeling! Beautifully written. Now u out have dome idea of why I was willing to retire there forever!!! Yes, I can see why. It is such a lovely place. Inspiring! Must add to our itinerary! Let me know when you go...I want to follow your travels. You are living our dream and I really enjoy tracking your international journeys. When we retire in a few years, this is our goal. Munich would be wonderful, especially since my husband had family who can from the area. Besides, the food is sure to be delicious! You must make it then. You would love the walking and the cafe society that is part of that city's life. Right on! I love all sorts of older German cities because they have kept their town squares active. Celle, Bremen , Köln Hannover and the list goes on. Still Other places in Europe offer a similar experience. I am glad to hear that...we plan to return.